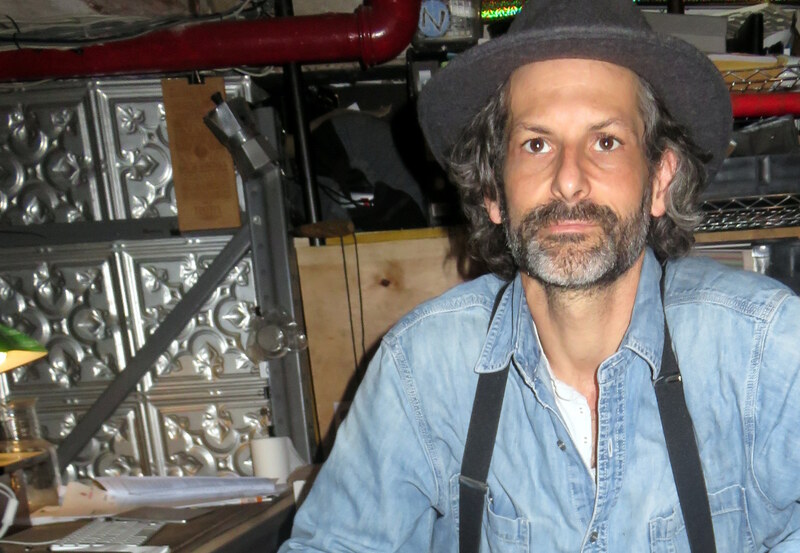 David Donde is a complex mixture of creativity and a mechanical engineering mind. From early on in his life he has been confident, restless, determined, looking for an environment to create something extraordinary. 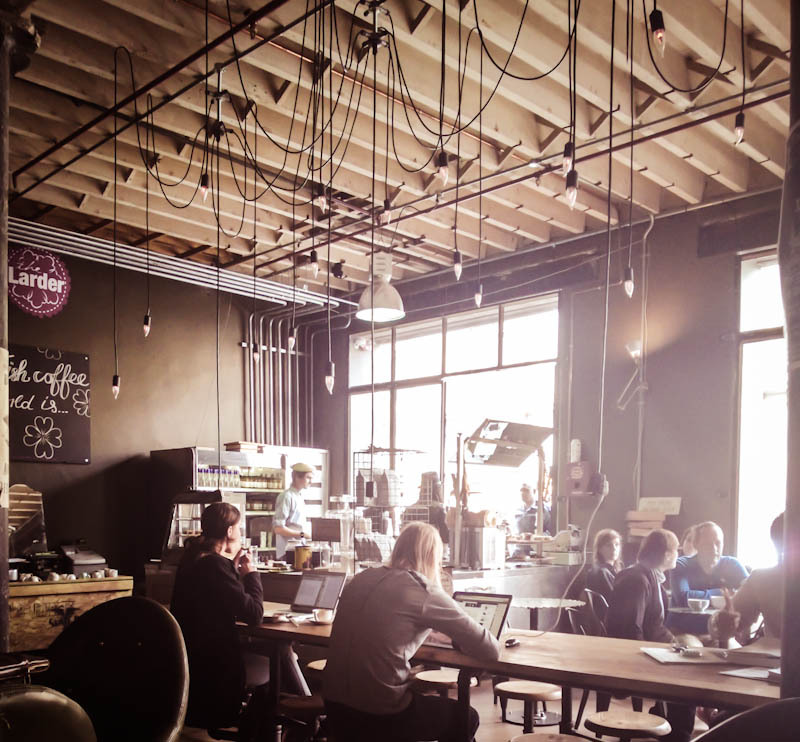 He found this in the world of speciality coffee, which brought him success and fame throughout the world. David is much more than a coffee entrepreneur. I discovered this when I had the privilege to interview him one rainy morning in September 2015 at his Truth Coffee Roasting in Buitenkant Street, Cape Town. Driving into the city to meet David, my mind wandered to the historical setting of Buitenkant Street. I love climbing Table Mountain and do it at least three times a week. I have looked down on Buitenkant Street for years and told the story to countless fellow hikers from around the world. A freshwater stream that emanated from Platteklip Gorge meandered its way across the plain, forming branches as it made its way to the ocean. Two gorges in the North face of Table Mountain, Platteklip Gorge and Silverstream Ravine, feed water into this one stream of fresh, sweet water (2) that Europeans called Rio Dulce or Fresh River (3). (Herbert, T.; 1928: 300) These still feed the same river, now, not freely flowing across the land, but having to suffer the indignity of being forced underground and being collected in the Malteno Dam. 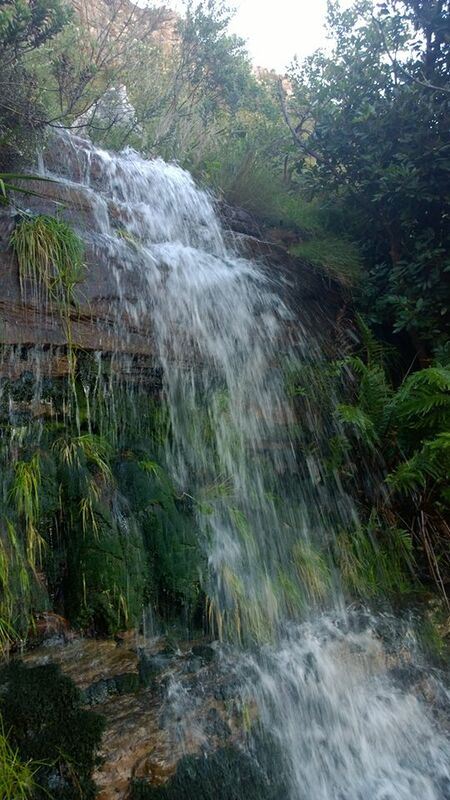 Back then, the fresh water stream ran from Platteklip Gorge on Table Mountain, across the plain, into the Atlantic. Next to the Fresh River there were footpaths, made and used by animals as well as Khoekhoen since a time long before the first European set foot on this magnificent land. If you were there on 5 April 1652, you would have seen the VOC (the Dutch abbreviation for the United East India Company) ships under Jan van Riebeeck, arriving to set up a replenishment station for the company’s ships travelling from Europe, en route to India and Asia or the route back. Ferrying, most notably for our project on the history of bacon curing, shiploads of saltpeter from India to be sold to the empires in Europe. It was at this fresh water streams’ entry point into the sea that a castle was built by European settlers in order to protect the water. Building work started in 1652. (4) (Hondius) A stronger castle (the present day Good Hope Castle) was built between 1666 and 1679. In reality, the protection of the water never became necessary and the Good Hope Castle came to serve as the command centre and seat of government for the small colony for years to come. Buitenkant street was one of the city boundaries with the military stationed along it for protection. It became central to the life of one group in particulor who was instrumental in the creation of a new language, Afrikaans and who is one of the groups on whose misery, a multi-cultural nation would be build many years later. These people were the Cape Slaves. 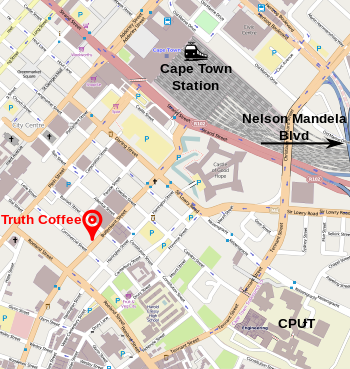 Truth Coffee Roasting, Buitenkant street, Cape Town. 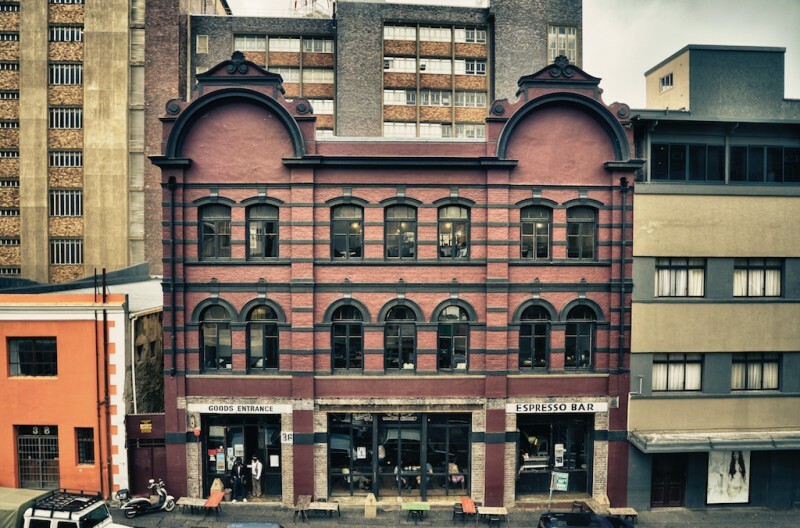 It was on this iconic street, steeped in so much history, where the soul of this magnificent land was first lost as Europeans altered the landscape; on one of the borders where misguided settlers imposed their view of order; on this street, at number 36 Buitenkant Street a true legend was created. 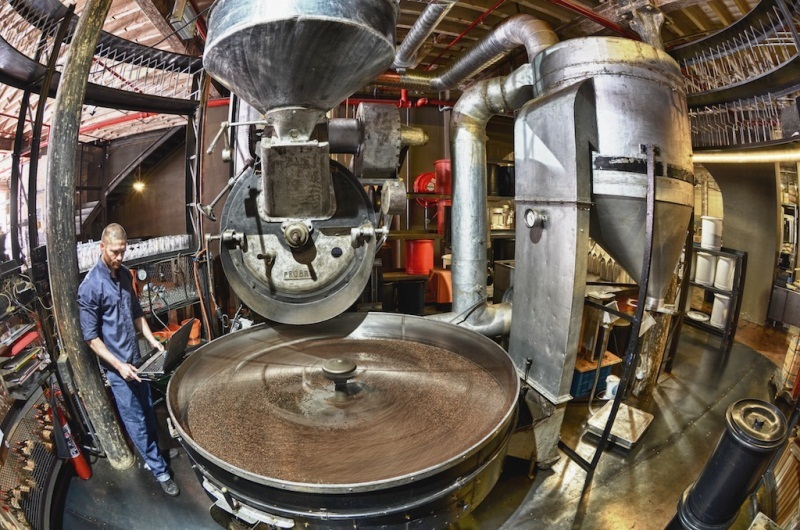 On a street of unfortunate endings and tentative beginnings by slave people and colonists, a remarkable man, David Donde, native of this majestic land, decided to set up his Truth Coffee Roasting and create the finest coffee experience in the entire world. It is here where I settled into a chair in David’s office “spot” overlooking his iconic coffee roasting where I got to know this inspirational man. David must have had a natural understanding and affinity for technical and mechanical matters from an early age. After school he enrolled at UCT in mechanical engineering. At the end of the first year he got called into the Dean’s office. He was told that he did not actually fail, but the Dean could see that he did not want to be there and challenged David on the point. He advised David to go and do something else for a year and if he is ready, to come back. They never spoke again. He then tried his hand at industrial design for 6 months until he was thrown out. His family had a chicken farm which he was forced to run. He initially helped out only and 10 years later realised that chicken farming was not his profession of choice. Writing the article and reflecting on this, I smiled as I realised that where family and close relationships were involved, David stuck around for 10 years. I love this. In a sense this may be the most important feature of David’s character! He has not achieved success by a ruthless, irresponsible pursuits of his dreams. That he has boundless energy is clear. A restless pursuit of excellence, a talent for mechanical gadgets, a keen intellect, pragmatic creativity, warm, personal and a firm grounding in what life is really about shaped his entrepreneurial pursuits. In 1994 he put up the Barnyard Farm Stall on Steenberg Road, Tokai, which he ran together with the farm. After selling the farm stall and the farm, he moved to Greyton where he bought the Post House Country Hotel. Here he first started roasting coffee. After his divorce he moved back to Cape Town, co-founded Origin Coffee Roasting and in 2009 he opened Truth. In 2012 he moved to Buitenkant Street. In 2015 Truth Coffee Roasting was mentioned by acclaimed UK news agency, The Telegraph, as being the very best in the whole world. 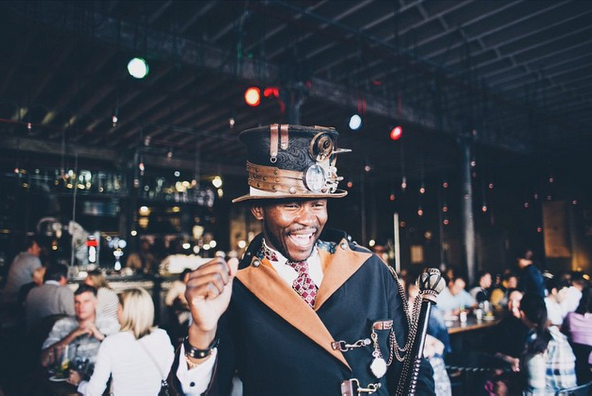 When one visits Truth, your senses are overwhelmed by the amazing, one of a kind decor and ambiance. I know that underpinning the astounding creativity must be a deep and profound understanding of the art of coffee. Great decor will give you an excellent business, but decor, combined with a real understanding of the art is how a legend is made. Many articles have been written about Truth, featuring the design, costumes and ambiance, but I have not come across many that delve into the science underpinning the Truth phenomenon. David’s general methodology is simple and pragmatic. He learns from the best, both locally and internationally and questions everything. By questioning, you gain a real understanding into what you are trying to do. It was on a trip to New Zealand where David discovered speciality coffee and he was introduced to the work of David Schomer, the father of modern coffee. The history of the development of speciality coffees, the birth of the modern art of coffee and the science underpinning it became the sparks that ignited David’s love affair with coffee. In the same way, the historical developments of the art of bacon and understanding its scientific principles, matured and deepened our love affair with bacon. It is the reason for this work on Bacon & the art of living. For David, the only question you have to ask to determine if a so called expert knows what he is talking about is the question “Why?” Ask that and all of a sudden someone who was very sure of himself moments ago is not so sure any more. David pointed out that this was the fundamental question that David Schomer asked when he went to Italy and began asking why one coffee was better than another. The answers he got revealed the bankruptcy of the thinking about coffee at that time and in seeking the real answers, a world opened up for him as the age of modern coffee was born. The current focus point for David is the solubility of coffee. Once he has learned and applied all he can about solubility, he will move on to the next topic. David is emphatic that there is nothing secret in coffee. Everything is on the internet. We have not a single new idea. All we do is to improve on things that have been thought and invented in the past. This concept of “no new thought” led us to a discussion on bacon brines and the water used in meat processing. Water is very important for David since coffee is 99% water. In particular, the calcium percentage matters to him. A higher calcium content carries the coffee flavours better. Coffee in Cape Town tastes totally different from Coffee is Hout Bay for example due to the difference in the water and not necessarily the difference in the coffee. In speciality coffees all one cares about are flavours. Until four weeks ago, David told me, we talked about 5 basic flavour groups. Today we talk about 6. You have sweet, sour, salty, bitter and umami. Over the last few weeks one more was added. Fat! One is able to taste fat. I told him about a pork banger we produce that is 50% fat and the flavour explosion in your mouth that it creates. David rides mountain bike races on fat and has great results on it, as opposed to carbs. In a recent race where he did this he came 34th. Impressive for a man with a demanding day job! This fascinates me because the matters of flavour in bacon, sausages and cured meats are so key to what we do. Where the world has shun fat for long, it is the carrier of much of what makes food exceptional and we are learning every day that it is not as bad for us as we always thought. It is not often that I get a chance to speak to a food scientist from another industry and I questioned David about possible benefits for the meat industry that may be found in coffee. I have previously explored the possibility of a coffee brine for bacon, but abandoned it when the flavours did not seem to be compatible. David suggested that I approach the question differently. He challenged me to ask if there is not a component or an inherent characteristic of coffee that can be used in bacon production. Not to make bacon taste like coffee, but to serve good curing, flavour development, etc. generally. In particular, David suggested that we focus on any matter that would help tenderizing meat. We discussed the production of a superior bacon at length. Predicated upon the principals of dry curing and tank curing or Wiltshire curing where conditions are created for enzymes to perform their softening work. We spoke about the advantages of doing this in an environment under vacuum. What frustrates him about the age we live in is that we are trying to be super specialists and don’t trust the idea that someone can be good at a multiple of things. David has the ability to demystify seemingly complex processes. The case in point is the fact that he immediately saw the basic process of curing bacon as similar to fermenting beer or producing wine. Superficially this is not the case, but the more one understand the basic principles at work and the history behind fermentation technology and curing, you realises that he is right. A few random, interesting facts about David came up in the interview. Every morning at 5:55 you will find him cycling. Mostly around Cape Town, but also around the world. David is not franchising the Truth concept. From Truth they supply coffee. Besides a coffee entrepreneur, David is a motoring journalist. It blends well with his mechanical talents. He has been doing it for 5 years. Even though he is not currently restoring cars, he is “inclined to be doing it.” The thing that would irritate him is not finishing a project like a car restoration. Management style: He believes he is not a good manager. Outlook: David is currently reading on migration in South Africa. Especially in the context of giving land back. The question comes up: To whom do you give it back? The only people one could really give it back to have been killed by us. The strandloper is gone. On the future of South Africa David said: “I dont know. It all hinges on economics and economics hinge on personal greed. I live in hope!” I asked if he will ever leave South Africa. His answer was an emphatic “No!” He is South African and will stay here for the rest of his life! Laurance Green recorded a picturesque recollection of life in Buitenkant Street in 1960 from very old sources. He recounts one such recollection involving the slave-woman from Buitenkant street and the Platteklip Stream. 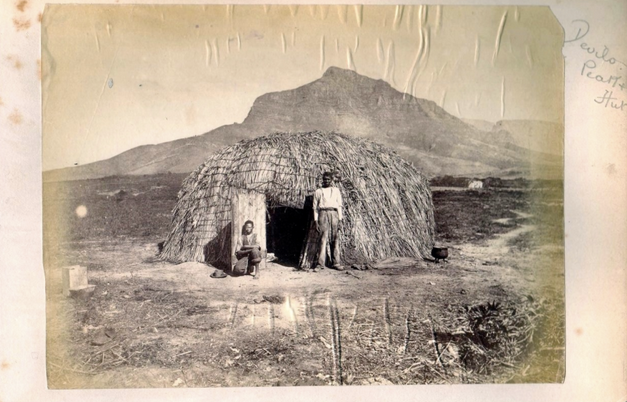 “I knew Platteklip in the days when Malay washerwomen worked there in scores. Long before the wash houses were built, slaves carried Cape Town’s laundry on their heads to this stream, and laid the clean clothes on the flat rocks to dry. Many an author recorded the picturesque scene. Lady Duff Gordon wrote a century ago: “Tomorrow my linen will go to the top of the giant mountain … and there be scoured in a clear spring by brown women, bleached on the mountain top, and carried back all those long miles on their heads, as it went up”. In fact, her linen went no farther than Platteklip. There the Malays found all they needed without climbing higher than the foot of Platteklip Gorge. Van Riebeeck issued a placaat forbidding the pollution of streams in the settlement, so the Platteklip custom must have started very long ago. 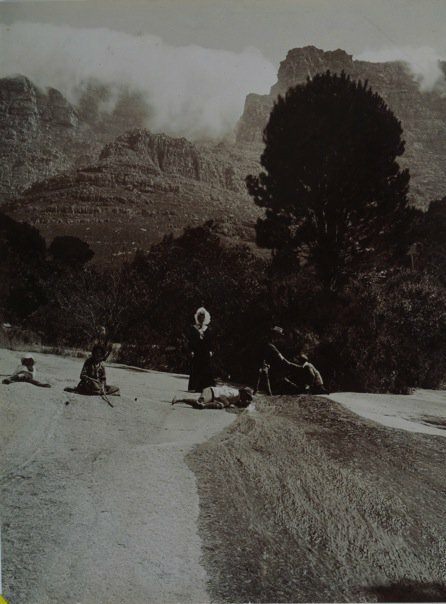 One of the sights of Old Cape Town was the long procession of Malay washerwomen, huge bundles on their heads, swinging along up Hope Street and Buitenkant Street in single file. For many years they used the stream and the rocks provided by nature. Wash-houses were built three quarters of a century ago, with seventy cement wash-tubs and proper ironing facilities; and the women paid three pence a day. I sit at David Donde’s Truth Coffee Roasting and look up Buitenkant street towards Platteklip and I see the woman in single file, with washing on their heads, slowly making their way to the stream. I think how fitting it is that David settled his business here, in this street where the voices of hardship and also of hope, emancipation and liberation merge and sound the loudest. Where he showed that excellence is within each person’s grasp, no matter your background. That this is an age where anybody can dream and achieve; when information is at our fingertips. I take another sip of my double flat white latte and I swear that for a moment I hear the slave-women sing to the tune of an old Malay orchestra! Note 2. Platteklip Gorge and Silverstream Ravine, feed water into one small stream of fresh, sweet water that Europeans named Rio Dulce or Fresh River. It ran from Platteklip Gorge, across the plain, into the sea. During the summer it is only a trickle of water, but in the winter it is transformed into something majestic! Note 3: Platteklip Stream, c 1900. Map of the Cape of Good Hope by Isaac Tirion dated about 1730. (© Nationaal Archief, The Hague, 4.BMF . no.471) from tanap. 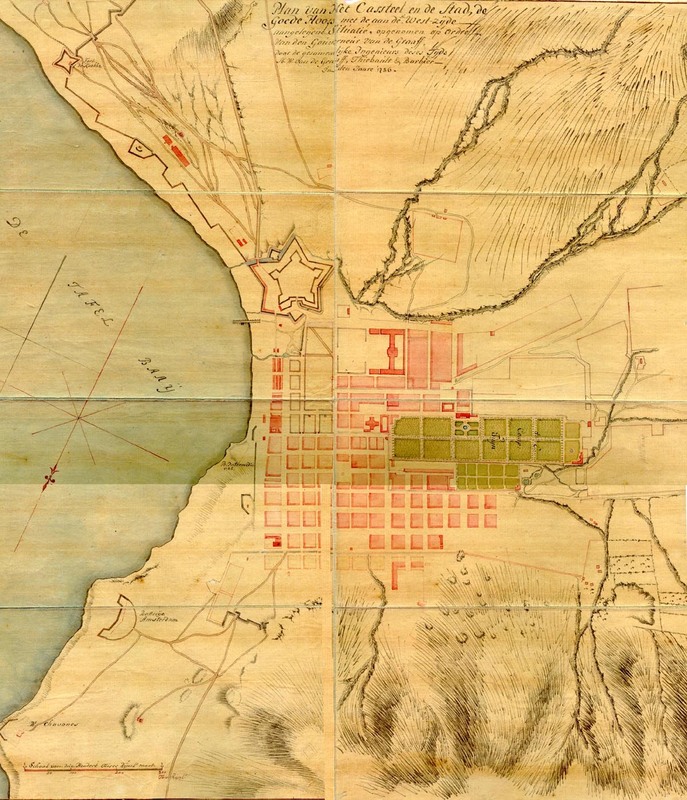 Note 6: Map of Cape Town, 1770 showing the VOC’s Slave Lodge. Plan of Cape Town by Francois Valentijn, 1770. The map shows a stream running along the way of the modern day Buitenkant street with plantations and buildings facing the street. It also shows the deviation of the streams when one compares the 1730 and 1770 maps. 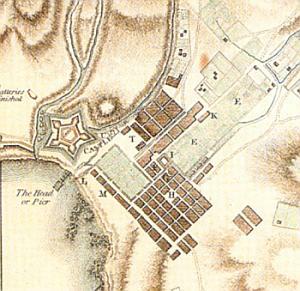 Map of Cape Town, 1770 showing the VOC’s Slave Lodge. Plan of Cape Town by Francois Valentijn, 1770. Note 7: Location of Truth on a modern map of Buitenkant street. Modern day Buitenkant street showing how the street followed the form of the stream. Green, L. G.. 1964. I HEARD THE OLD MEN SAY. Secrets of the Cape That Has Vanished, and Little-Known Dramas on the Fringe of Living Memory. Timmins, Cape Town. Richards, J. F.. 2003. The Unending Frontier: An Environmental History of the Early Modern World. University of California Press. http://www.highbeam.com/doc/1G1-348048331.html The Plague That Came from the Sea.